Let me first start by saying I don't enjoy talking Politics, it's just not me. Blame the liberal, all-loving, southern California upbringing. I didn't start this blog to run my mind about touch-y issues. But Fashion, love, pretty-little-things, yes! However something has been making me think and just want to say a little peep. I may end up deleting this post or maybe not. So anyway bear with me....and promise to come back. WTF GOVERNMENT!!!!!! Did we learn nothing from Katrina?! You need to get active in LIFE-ALTERING events waaaay quicker. Case-and-point : BP OIL CATASTROPHE. These photos rip my heart out. This is what I wanted to share. It isn't a political rampage or really a 'my side' view point. It is just a bit of what the news isn't showing, limiting the public from knowing what is already going on. 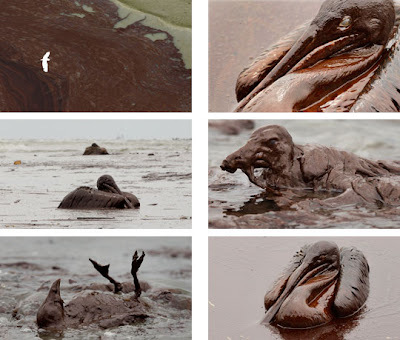 Well, what BP isn't allowing us to see - but when were they the ones to dictate it. So, BP go home. (But only after you pay us loads of $ to fix this area to an even better state than it was before). K, promise you will come back to regular pretty-little-things blogging???? Plllluseeeeeeeeeeee! Thanks, kisses. i don't even think its a political issue, its just a life issue. I don't understand why more isn't being done to help the wildlife. It's so upsetting.